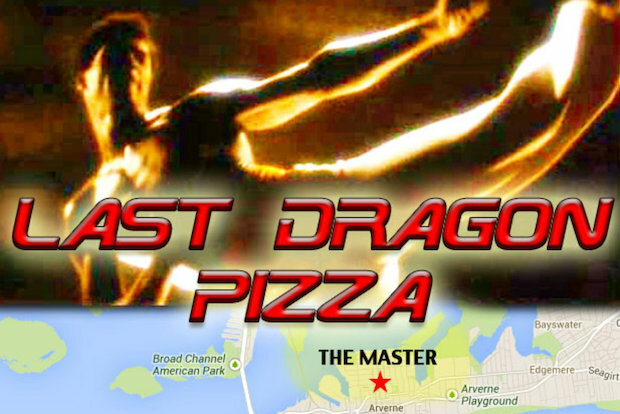 An amateur pizza chef is looking to kick her pizza making into high gear with an underground takeout service inspired by the classic, New York City-based kung fu flick "The Last Dragon." Last Dragon Pizza is the creation of Nicole Russell, 41, a super-fan of the cult classic film who slings her pies like blue arrows at her home in Arverne, limiting what she offers and how many she makes as she continues to test the market. "It's just specialty pies, and I don't want to overwhelm myself," she said. "If it really takes off, in the summer it's going to be even busier." She takes the name, and much of her inspiration, from the 1985 film that follows aspiring master Leroy Green (also referred to as Bruce Leroy) as he travels around New York City trying to achieve the highest level of his kung fu training. Pizza figures prominently in the movie, with Green's family owning "Daddy Green's Pizza." Russell, who works as a graphic designer, said she always cooked for family and friends — but wants to master her craft. "It's so hard to get food in Rockaway — and so my neighbors, they started coming to me," she said. Russell whips up just 20 of her seven signature pies a day, and limits her cooking to Wednesday and Friday. She closes up when the last pie is done and offers curbside pickup, only revealing her location in the Beach 60s after the order has been made. The pies, which range from $10 to $20, are named for characters and places from the flick — with a few details from Russell's own background in cooking. The "Sho'nuff," named for the film's main villain, is a Philly cheese steak pizza, covered in three cheeses, steak and peppers. The "Kiss Mi Converse," after a famous line that Sho'Nuff says to Green, is inspired by Russell's Jamaican heritage and is covered in jerk chicken, peppers and olives. And the "Sukiyaki Hot Suki Sue"— with a "You Sock It To Me, I Sock It To You" tagline — is covered with sweet Asian barbecue chicken, mushrooms and onions. The other pies, including the "Laura Charles" after Green's love interest, the "Daddy Greens" and the "Ninja Puh-Leeze" are more traditional pizzas, Russell said. "I wanted people who love the movie to just get a laugh and a kick out of it and reminisce over different scenes," she said. The film brings back great memories for Russell, who grew up in Arverne. She said she remembers walking the nearly 2 miles with her older sister to the peninsula's now-shuttered independent movie theater, Surfside Cinema, to watch it on the big screen. "On the way home were were hopping around thinking we were the Last Dragon," she said. "It's something that's very nostalgic to us." When she started discussing the possibility of selling food, her sister jokingly suggested making pizza inspired by the film. "It just felt right," she said. Business has been through word of mouth and so far the response has been great, she said. She made seven pies on Wednesday and 10 on Super Bowl Sunday. While she's now focusing on the kung fu pizzas, Russell said she may look to expand to others based on classic films like "The Rocky Horror Picture Show." For now, she's happy to continuing cooking for her neighbors. "I remember everything great about Rockaway, and I love it here," she said. "I'm so happy I can provide something fun for people to enjoy." Customers can order online or by phone and pay with credit cards for the pies, either the day before or up to two hours before pickup. For more information, visit her website.